Ask 100 writers what the perfect writing environment would look like, and you'd no doubt get 100 vastly different answers. However all the responses would have one thing in common - a secure place which has the ability to inspire the shyest muse. If you're an author, you understand the need to have a special area that stimulates your thinking, especially if you've ever tried to create in an environment that is hardly conducive to writing. But what if you don't have much of a choice? After all, apartments and houses can be small; offices can be crowded and noisy; and park benches are ergonomically dreadful. Believe it or not, you can still create a pleasant writing setting, even if your budget and space are limited. Or "sound on", depending on your personality. If you work best in a quiet atmosphere but you must write in noisy conditions, try investing in some headphones. You could also purchase an MP3 or CD player, pop on the earphones, and listen to "white noise" or very settling classical music. Of course, if you prefer to have earsplitting sounds blasting around you in order to focus but your writing environment is about as raucous as a morgue, you can use the headphones to blare the radio or downloaded tunes. Even if you're forced to write while wearing a suit and tie or dress and hose, you can still be comfortable. If you sit at a desk all day, take your shoes off (make sure you're wearing socks or nylons, please); sit cross-legged (when the boss isn't looking, unless he or she is open-minded); or move around occasionally to accommodate your physical needs. After all, if your back is screaming in pain or your belt is cutting off your circulation, you'll never be able to write at your top level. If you work out of your home, being relaxed is just as critical. Make sure that your desk and chair aren't sapping your energy; hunching over while writing can put undue stress on your muscles and create premature fatigue and even long-term injuries (such as carpal tunnel syndrome.) Invest in properly designed and ergonomically-correct office furniture right from the start and you'll avoid medical problems later. You'll never be able to write at your best if you feel like you're in a "borrowed" space. 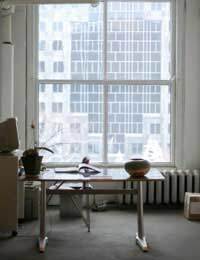 Though you probably don't feel like you're sharing an environment if you write at work (unless you're a part-timer whose cubby is used by others), if you work out of your house or apartment, you've probably wondered where your office begins and your living space ends. Never forget that you hold the keys to your success as a writer; thus, you need to create the best possible working atmosphere to hone your craft. It'll be good for you as both an artist and a professional. I am new to this page and hope it will teach me a lot . I learned alot from this page and I really looking foward to the rest of this book.